The marine energy Technology Assessment Process (TAP) is an integrated evaluation and development pathway for early stage wave and tidal technology developers. TAP provides a standardised framework for the assessment of new and emerging wave and tidal energy developers allowing technology to be benchmarked in a number of key areas. Experts from EMEC and the Offshore Renewable Energy (ORE) Catapult will work with developers across a range of uncertainties and risks associated with costs and performance. This approach significantly de-risks technologies before they reach prototype testing stage and allows developers to focus on the areas that are most important, resulting in a less expensive, faster and more focused development pathway. 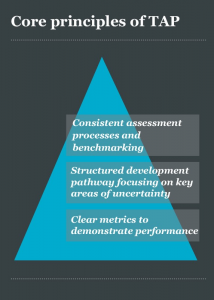 The TAP methodology is designed to track progress and build evidence of performance as technological ideas progress from one stage of development to another. An evidence-based dossier – the Technology Passport – will help to map the developer’s journey through the development process, identifying milestones towards technology commercialisation and development support opportunities. Improved focus and risk management. Corroboration of competitive prospects at each stage of the development journey. Better informed investment decisions with improved confidence and reduced risk. Better matching of investment to strong, feasible technical ideas. Better visibility of respective technical strengths when evaluating competing ideas. Better on-going confidence through periodic independent review.